Shredded omelette salad is a popular Asian dish which prepared with ingredients such as soy sauce and rice vinegar. However, I prepared this Shredded omelette salad using our very own Sri Lankan salad dressing, which is a combination of salt, crushed black pepper and fresh lime juice. It came out very well. 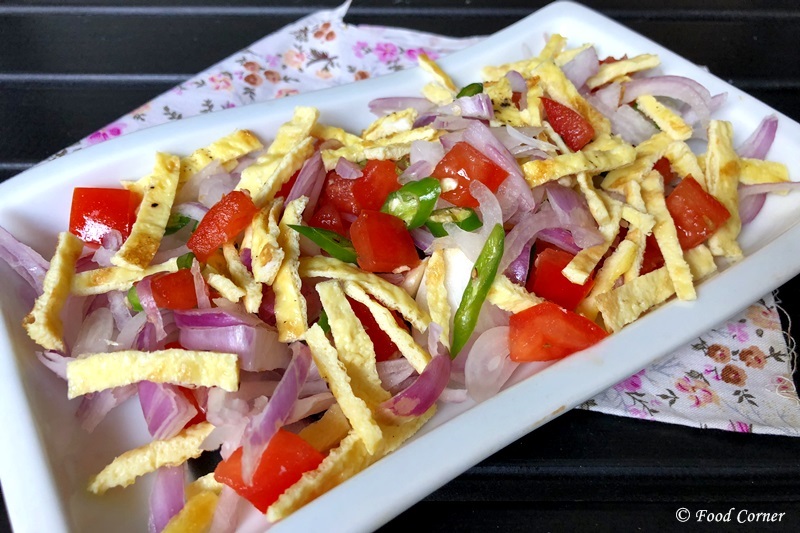 So, I am sure you will like such an easy omelette salad for your meal too.On the other way,if you look for omelette ideas,then try this recipe too.It will be a great addition to your menu ideas.If you look for easy omelette recipe then check this veggie omelette recipe by clicking here. 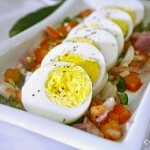 If you like to try different egg recipes, then try this egg salad recipe which hard boiled eggs are used. 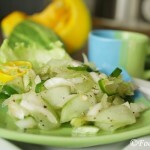 In case if you want a simple salad recipe, then why not try this cold cucumber salad? 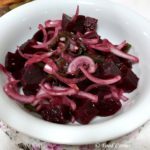 There are many salad recipes shared in this food blog. Lightly oil a wok. Heat the wok on medium heat, Add egg mixture when the wok is hot enough to make omelette. To cook omelette, swirl the eggs to coat the wok. Once the egg omelette is done, remove it to a plate. Make sure your egg omelette is thin. 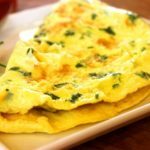 When the omelette is done, slice thinly into bite size pieces. Slice onions and green chili. Remove seeds and cut tomato into small cubes. In a bowl, combine onion, green chilli and tomato. Add salt and crushed black pepper as per taste. Add lime juice and mix the ingredients well. 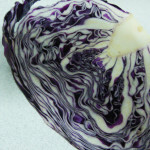 This step is similar to Sri Lankan Onion and green chili salad. 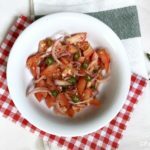 Once the onion, green chilli and tomato are combined well with lime juice, salt and pepper as per taste, sprinkle thinly sliced omelette over the salad. 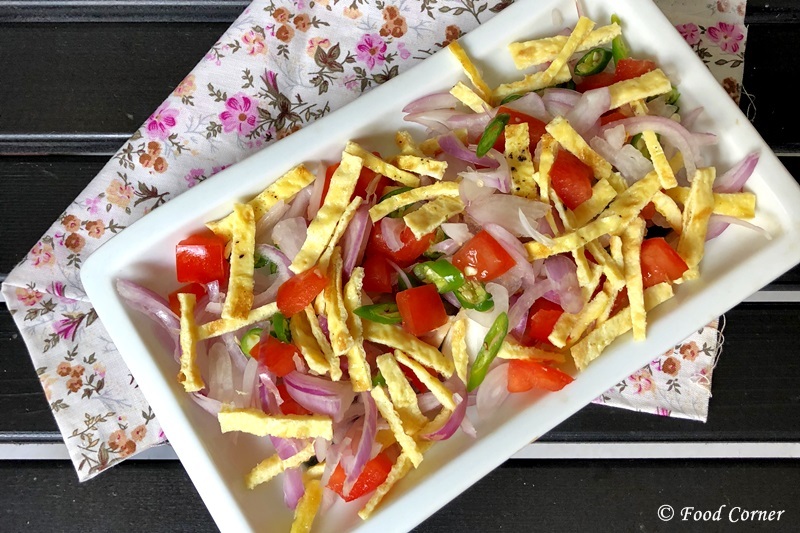 Shredded omelette salad is ready to serve. This salad is good with Fried Rice too as a side dish. 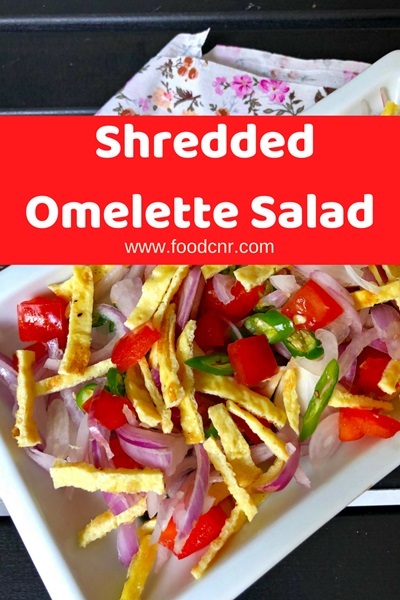 If you try this Shredded omelette salad, please share your experience as a comment.